Features: Mussaenda is a tropical shrub or sub-shrub reaching 10 feet tall, though can be trained as a single specimen of 5 feet on ground or less than 3 feet in containers. 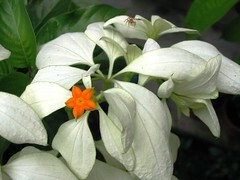 Each flower is composed of an inconspicuous small tubular five-petalled corolla in orangy-yellow and five greatly enlarged sepals (bracts). It is really these showy corymbs of white or off-white enlarged leaf-like sepals that contrast beautifully against their dark green elliptic to ovate leaves that are the attention grabber. 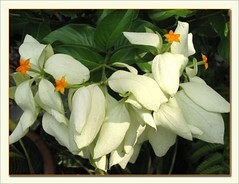 Usage: White Mussaenda or Virgin Tree as commonly known can be grown as ornamental in parks and public gardens or along roadsides, byways and highways. Use in landscaping, this plant serves well as a decorative specimen with its showy blooms and would fit beautifully in home gardens too! 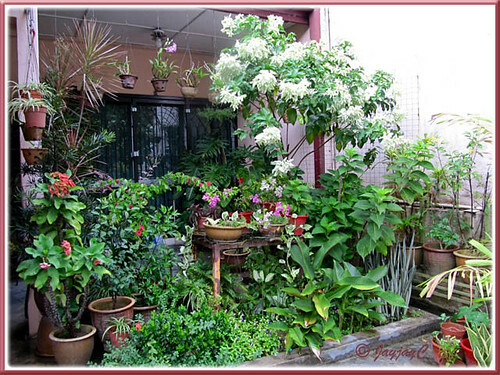 Attractive to butterflies, bees, hummingbirds and insect pollinators as a nectar plant. 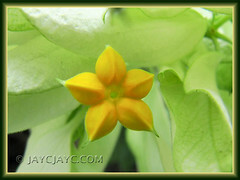 Care: It is best to prune the Mussaenda philippica after blooming to get a bushy plant, though the lower stems tend to become bare however much you prune. Sepals or bracts colour best with full sun and need it to flower continuously, though they’d prefer filtered mid-day sun in hot climates. No known serious insect or disease problems but do watch for spider mites and whiteflies on indoor plants. We’ve often times admire those gorgeous Mussaendas seen along roadsides or countryside, especially the pink cultivar known as Mussaenda philippica ‘Dona Luz’ but never thought that it’ll suit our small garden. However, sometime last August, we were introduced to this attractive white cultivar, Mussaenda philippica ‘Aurorae’ which is smaller than the pink one as informed by the nursery chap! Straightaway, we gladly adopted home this small plant of about a foot tall that already showed promises with 2 corymbs of lovely white bracts then and it had been as wonderfully showy since! November 18, 2007 – View the stunning blood-red Mussaenda erythrophylla! 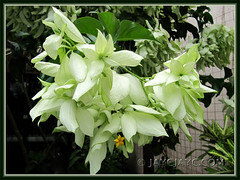 November 22, 2007 – Mussaenda luteola, a third cultivar grown in our garden too. 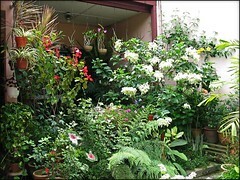 Just sharing our garden as seen in February 2010 to show how lovely the Mussaenda philippica ‘Aurorae’ (White Mussaenda) tree has flourished. We love that it provides some shade for the plants below and really illuminates the garden, especially in the late evening! Sorry… I’ve no clue about whether Mussaenda can survive close to the ocean. 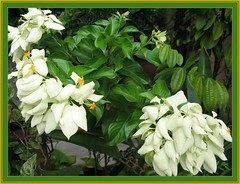 I’ve read about your article about Dona Aurora plant.Please send me an information on how to grow/plant this flowering plant.I would like to grow one in my front yard together with Dona Luz and Kalachuchi as well. 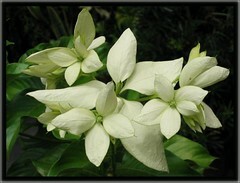 This post is about Mussaenda Dona Aurora which already include how to plant it. Do check out our post on Dona Luz @ https://www.jaycjayc.com/mussaenda-philippica-dona-luz/ to know more about its growth, culture, etc.